UPDATED 7:24 P.M. EDT (U.S.A.) Michael Fayad and Jonathan Goodman of Akerman Senterfitt have asked a federal judge to withdraw themselves and the firm as attorneys for AdSurfDaily Inc.,Â Bowdoin/Harris Enterprises Inc. and Andy Bowdoin. At the same time, the firm cited attorney-client privilege with respect to its communications with Bowdoin. “After this Court denied Claimant’s Emergency Motion for Return of Seized Funds [on Nov. 19, 2008], the client-lawyer relationship between the Firm and all three Claimants substantially deteriorated and has not improved thus rendering the representation unreasonably difficult,” the lawyers said. U.S. District Judge Rosemary Collyer ordered the lawyers to instruct Bowdoin on critical points of law last week, after Bowdoin had filed a series of motions acting as his own attorney. The firm never formally withdrew from the case, but Bowdoin said in court filings that he had fired Fayad and Goodman. Akerman Senterfitt advised Collyer today that it had contacted Bowdoin and his corporate alter egos “recently” and advised them on the critical matters, which dealt with a rule that corporations could not proceed as pro se litigants. “The Akerman Senterfitt law firm has recently been able to contact its clients and has obtained their consent to withdraw from representing them,” the firm said. It did not say how it contacted Bowdoin or identify his whereabouts. Collyer said last week that AdSurfDaily Inc. and Bowdoin/Harris Enterprises Inc. could not represent themselves pro se on claims to seized proceeds because they are corporations. Bowdoin is permitted to represent himself as an individual on claims, but the corporations must have an attorney. Plaintiffs in a racketeering lawsuit against Bowdoin that is separate from the forfeiture case said they have not been able to serve Bowdoin or co-defendants Robert Garner or Clarence Busby. Garner was an ASD attorney. Busby was president of Golden Panda Ad Builder, a company whose assets were seized in the ASD probe. The RICO lawsuit has been pending since Jan. 15. A second summons was issued March 18. Why Bowdoin, Garner and Busby have not been served is unclear. Garner is listed as a director of AdSurfDaily Inc. in Nevada corporation records. But ASD’s incorporation in Nevada appears to be in default for not filing an annual update of officers by Dec. 31, 2008. ASD is listed as a Nevada-based foreign corporation in Florida, with Bowdoin holding the titles of director, president, secretary and treasurer. Garner’s name is not listed in the Florida documents, which were filed May 23, 2008. ASD, in longhand, listed its address as 13 S. Calhoun St., Quincy, Fla., in its May 2008 Florida filing. Federal prosecutors said the address was bogus. The same address is listed in Nevada corporation records. Public filings suggest that the U.S. Secret Service was on the ground in Quincy prior to the seizure of ASD’s assets last August. The forfeiture complaint contains a photograph of an ASD sign the prosecution said listed the bogus address. Florida filings from 1995 and 1996 by Bowdoin’s wife, Edna Faye Bowdoin, list the address of the building ASD went on to use as its headquarters as 11 S. Calhoun Street. The building once was home to Faye’s Florist Inc. The same building was listed by Edna Faye Bowdoin as having the 13 S. Calhoun Street address and serving as headquarters for Bowdoin/Harris Enterprises, according to June 2008 Florida records. Fayad and Goodman today did not say where Bowdoin could be reached, acknowledging that they were aware of his pro se pleadings because they were a matter of public record. specific issues underlying the problems with the client-lawyer relationship,” the firm said. “However, without breaching the attorney-client relationship, and based on documents which Mr. Bowdoin publicly filed with the clerk’s office, it is obvious that Claimants have decided to represent themselves without consulting their counsel,” the firm continued. In a proposed order for leave to withdraw as Bowdoin’s counsel, the firm said Bowdoin’s last known address was 8 Gilcrease Lane, Quincy, FL 32351. AdViewGlobal (AVG), a surf firm that has close ties to ASD, introduced members to a firm known as Pro Advocate Group in February. Pro Advocate Group says it can help people practice law without a license. Bowdoin’s pro se pleadings began to appear at the same time AVG introduced the company. Karl Dahlstrom is associated with Pro Advocate Group. He was sentenced to 78 months in federal prison in the 1990s for securities fraud. Fayad and Goodman filed notice with the court last fall that Bowdoin would exercise his 5th Amendment right against self-incrimination at the Sept. 30-Oct. 1 evidentiary hearing. Bowdoin did not appear for the hearing or take the stand. In his pro se pleadings, however, Bowdoin acknowledged ASD was operating illegally last summer when agents seized real estate and tens of millions of dollars amid allegations of wire fraud, money-laundering and running a Ponzi scheme. Bowdoin said he was denied “fair notice” that his conduct was illegal. Within days of his claim, Gary Talbert, a former ASD executive, resigned as chief executive officer of AVG. In view of what Bowdoinâ€™s pro se filing said publicly about them, it’s sure not surprising that his lawyers would want to withdraw. What is surprising is that the “group” that’s advising him would overlook something as basic as the fact that corporations cannot act pro se. It brings into question whether he’s been taken in by the “group’s” presentation of its services. And if his “group” is Pro Advocate Group/Karl Dahlstrom, it raises a question regarding the accuracy of the advice given to AVG regarding the shelter provided by becoming a “private membership association”. Might that, too, turn out to be a problem? Thanks for your comment. You raise some interesting and important questions. The thing that is most odd about this is that Bowdoin appears to have confessed to a crime in civil court before any criminal charges had been brought. It seems such an approach puts lots of people in jeopardy, including Bowdoin’s own family members and ASD insiders and top promoters. Gary Talbert suddenly resigned from AVG within days of Andy’s aknowledgement that ASD was operating illegally at the time of the seizure. And then an AVG banking problem rapidly emerged — all while AVG was pushing a 200-percent, matching-bonus program. Coinciding with this was Bowdoin’s video appearance for Paperless Access and the issuance of a second summons in the RICO case. As readers have pointed out, some of these things are very hard to reconcile. With respect to the pro se pleadings of Curtis Richmond and three others using the Richmond blueprint, the theory was that Richmond and the others were engaging in legal commerce. But Bowdoin’s pro se pleadings seem to take that argument away. I mean, he said ASD was illegal — right in a public filing. Some of this couldn’t sell as fiction. Thanks for your comment. Judge Collyer has not yet granted the attorneys leave to withdraw. She’ll need to sign an order to do so, so permission has not been formally obtained. This withdrawal motion is brand new. The judge perhaps hasn’t even seen it yet. On the book, my what a project that’s turning out to be. I should have started a miniseries instead….. It will be a long book, it’ll make a lot of people mad, I’m almost sure convicted felon Bob Guenther (search engine optimization shameless plug) will sue me. It should be a lot of fun. On the book, my what a project thatâ€™s turning out to be.I should have started a miniseries insteadâ€¦.. It will be a long book, itâ€™ll make a lot of people mad, Iâ€™m almost sure convicted felon Bob Guenther (search engine optimization shameless plug) will sue me.It should be a lot of fun. Bob probably couldn’t find you. He hasn’t figured out Patrick’s vitals yet and “well armed bunker complex” doesn’t Google well. dirty_bird: Bob probably couldnâ€™t find you. He hasnâ€™t figured out Patrickâ€™s vitals yet and â€œwell armed bunker complexâ€ doesnâ€™t Google well. If Akerman Senterfitt are allowed to withdraw from this case, who will be representing the corporation & property? I suspect that there is no money to pay any lawyers, so will one be appointed by the court? 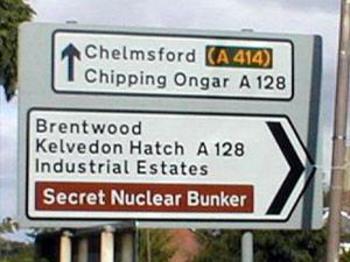 Perhaps itâ€™s sign posted?http://russelldavies.typepad.com/planning/images/secret_nuclear_bunker-thumb.jpgIf Akerman Senterfitt are allowed to withdraw from this case, who will be representing the corporation & property? I suspect that there is no money to pay any lawyers, so will one be appointed by the court? HOW DID YOU FIND ME???? ?